A machining operation in the system uses one tool. One of the key parameters for an operation is the cutting tool that is to be used. In the milling operations available in the SprutCAM system, the cutting tool must be an axial tool, i.e. : end mills, drills or engraver. 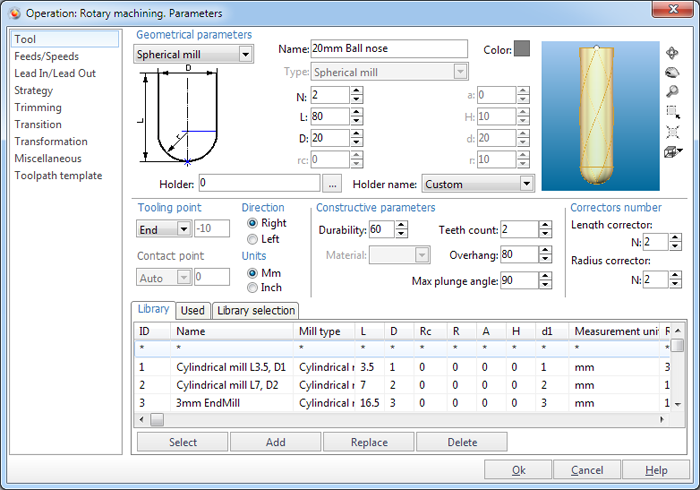 The definition of the geometrical parameters for a tool and other machining parameters connected to its use can be performed in the <Operation parameters> window on the <Tool> page. The window opens by pressing the <Parameters> button. There are 10 different types of tool which can be defined using a range of different geometrical parameters. <Torus mill>: length, diameter, rounding radius. <Double radial mill>: length, diameter, rounding radius at the cylindrical part, rounding radius of the peak. <Limited double radial mill>: length, diameter, rounding radius at the cylindrical part, rounding radius at the peak, height. <Conical mill>: length, diameter, rounding radius at the cylindrical part, rounding radius of the peak, angle. <Mill with negative radius>: length, diameter, rounding radius of the peak. <Limited conical mill>: length, diameter, rounding radius at the cylindrical part, rounding radius at the peak, angle, height. <Engraver>: length, diameter, angle, height, peak diameter. <Drill>: length, diameter, grinding angle. If the value of a parameter entered makes it impossible to build the tool, then this parameter will be highlighted in red. There are two graphics that display the current tool, the standard view and the real view. The standard view shows the chosen tool type with the key dimensions. The real view shows the tool in proportion using the current geometrical parameters and the type of the tool. The field <N> defines the tool number that will be entered into the NC program. If a previously used tool is required for a new operation, then this can be selected from the list found by selecting the 'Used' tab at the bottom of the tool page. <Color>. Indicates which color will be used for displaying the toolpath for the current operation and also the color of the tool during machining simulation. <Programmed point>. Indicates from which point on the cutter (end, center or custom) that the NC program will be calculated. <Parameter> – specific point of the tool profile. Either specify this point in the tool view window or input it into the edit field. <Direction>. Defines the spindle rotation direction as left (clockwise) or right (countrclockwise). <Measurement units> of the tool parameters – millimeters and inches. <Durability>. Defines the allowed working time for the tool in minutes. When the specified cutting time is reached an appropriate command will be added to the CLDATA intermediate language. The postprocessor, if the function is enabled, can output either a tool change command or add a note to the NC program. <Material>. Indicates the material the tool is made of. The parameter can be used for cutting speed calculation. <Teeth count>. Defines the number of teeth for a tool. The parameter can be used for cutting speed calculation. <Overhang> – the distance from the tool zero point to the tool programmed point. <Max plunge angle> – defines the tool maximum plunge angle into the work material. This parameter does not influence the calculated tool path but is used only to analyze errors during simulation. To control plunge angle of the tool path use the <Descent types in plane roughing operations> parameter or the like. <Length compensation>. When tool length compensation activation is required at the beginning of an NC program, the system inserts the required commands for this. The length offset number for the tool being used is entered into the field <N>, this will be output in the NC program. The compensation length value is for information only and is not output in the NC program. Tool length compensation is cancelled at the end of the program. <Radius compensation>. Radius compensation can only be activated for the 2D and 3D curve machining operations. When machining a curve on the right or left, the appropriate cutter radius compensation command will be added to the NC program. The radius offset register number should be placed in the field <N>, this will be the number used in the NC program. The compensation value is used for toolpath calculation and for machining simulation. The toolpath is calculated as an offset toolpath, which is calculated as the difference between the tool radius and the compensation value. If the offset toolpath calculated for the NC program needs to be the same as the contour itself, then the compensation value should be equal to the tool radius. By doing this the actual contour coordinates will be used in the NC program, but the simulation in SprutCAM will correctly display what will occur on the milling machine. When shaped tool or standard tool like Т-shaped tool, two-stage drill, thread mill is selected <Type> field is enabled which is used to specify exact tool shape required for machining. Once the parameters for a tool have been entered, they can be saved into the tool library for use in future operations. The tool library is displayed in the lower part of the tool page. <*> (asterisk) – an arbitrary string. <?> (question) – an arbitrary symbol. The interval and enumeration commands can be used for numeric parameter searches only. Find all tools with a name that contains the phrase "mill". In the <Name> field, type in the mask: *mill*. In the <D> field type in the mask: "10-20". Find all tools with diameter 15, 23, 47 mm. In the <D> field type in the mask: "15,23,47". A mask can be defined using either separate commands, or, a combination of commands. To use the selected tool, press the <Select> button.